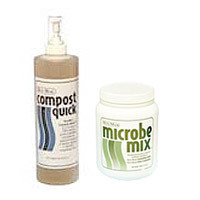 Compost Quick comes in a 500ml spray bottle. This enzyme liquid accelerates the composting action, leaving you with a perfect finished compost every time. It can also be used as a cleaner. To Use: 3-4 squirts of the nozzle before rotating drum. The drum needs to be rotated 4-6 revolutions every 2 days (when in constant use). Sun Mar Microbe mix (454g tub) allows you to increase the bacterial population of your composting toilet and hence increase the composting activity. Ideal for adding at spring startup to get proper composting action. Sun Mar recommend one scoop (included) every 2-3 weeks. You can have 3 of each or 6 of one thing or any combination. Just mention what you prefer or we will give you an equal amount of each.